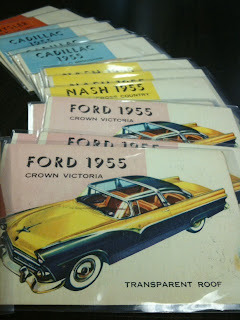 Baseball Card News by DeansCards.com: Recently Added: Great Collection of 1953 World on Wheels Non-Sports Cards! Recently Added: Great Collection of 1953 World on Wheels Non-Sports Cards! These cards are ready to drive off our lot and into your collection! The 1953 World on Wheels set began as a 160 card set when it was first issued in 1953, however an additional 20 cards were added to ensure the set included the newest models of the time. Dean's Cards recently acquired a collection of roughly 300 of the 1953 World on Wheels cards! Perhaps the coolest part of this collection is that it contains over 50 of the High Numbers (#'s 161-180)! Most of these cards are in mid-grade condition, so they are affordable for the casual set or singles collector. The World on Wheels cards truly do provoke nostalgia for classic automobiles many of us grew up with. So head over to DeansCards.com and check out our selection of 1953 Topps World on Wheels cards. Also, if you are a fan of these, you might enjoy 1961 Topps Sports Car Cards or 1955 Topps Rails and Sails Cards. I guess if you can't own the real thing, this is a good alternative. I guess I'm switching from basketball cards to classic car cards now.